This is my new favorite treat. Oreos, specifically mint oreos, dipped in almond bark with sprinkles on top. Ever since Logan's birthday I have made these for every occasion I can think of. Friend's birthday? Oreos. Dinner party? Oreos. Ran 7 miles? Oreos. Oh, did I not mention that I ran 7 miles? I did. This 10K is gonna be a cinch! Especially since I keep giving myself double stuffed reasons to run. You crack me up. And congrats on the 7 miles, by the way. That's pretty awesome! *sigh* I miss them already! NOthing wrong with a double stuff reason to run. 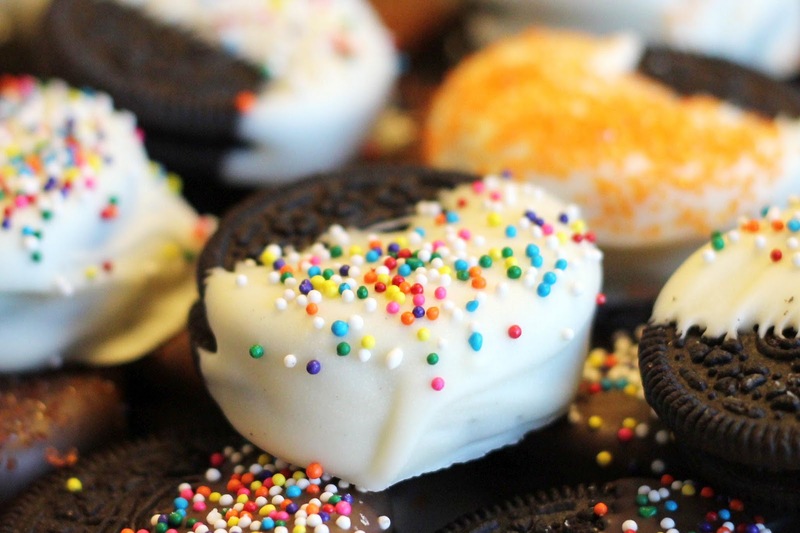 Love dipped Oreos with sprinkles! When's the 10K? Is there going to be a 5K there too? I've gotta build up my distance again. The 10k is the salmon creek turkey trot. You should sign up, kelsey! There is a 5k too.